The same goes for trading stocks in the market. There are over 6,000 stocks in the market, narrowing down this to a manageable list can be quite the task. Luckily, there has been tons of research published on exactly which stocks move higher; things like new highs, relative strength, price to sales, sector strength, earnings surprises will move stocks higher. (See resources at the end of this article). To the right, are links to the best stocks in the market today. The stocks found in each of these lists have been ranked on research basesd attributes such as relative strength, sector strength, value and short interest. Trader on a budget approach - Not everyone starting out has boat loads of cash to throw at hardware and software so I wanted to show the budget traders out there one way to identify stocks that are moving without using any additional software applications. Let's refer to the spreadsheet titled: "Watchlist: Top Stocks with Price and Sector Momentum"
30DayChg - 30 Day growth for this stock. If it is under 10% the cell will appear in green. Above 10% red. When swing trading momentum, it is critical that you buy the stock coming off of weakness versus the middle or even worse, the end of a move. The closer to support your purchase, the less risk you have on the table. I should clarify you are buying weakness off of a strong prior uptrend. We are not bottom feeding! cPct - Today's percent change. Again, we highlight the cell if the stock is up 2% or more for the day. This combined with the volume surge column will give you a good idea that the stock might be making a continuation thrust. 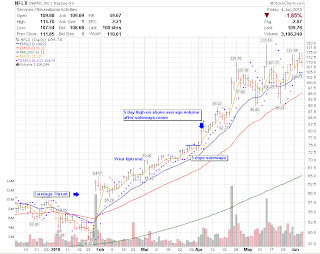 A Continuation Thrust means the stock has an upward trajectory but has recently taken some time to consolidate and is now continuing with the move. VSrg - This column tells you the change in volume over the average volume for a given period. The more volume, the more interest there is in the stock. OK, let's be very clear - because all of these columns are flagged in green DOES NOT mean this is necessarily a buy signal. If it were only that simple, right! What this does tell you is there is interest in the stock, and this stock has been historically outperforming a good majority of all other stocks. At this point, you can click the "Chart" link to view the chart over at stockcharts.com. I think a monthly subscription runs around $14.00 per month, fairly reasonable for what you get. (I do not receive any fees from stockcharts.com or any other service that I happen to mention on this site). In the case of NFLX, you get to see the entire set of trades. 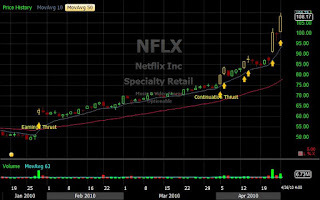 First it starts out with an Earnings Thrust on Jan. 27, 2010 "Netflix, Inc. Issues Q2 2010 Guidance In Line With Analysts' Estimates; Raises FY 2010 Guidance". It follows through on the earnings thrust and rallies for 7 weeks before moving sideways for a week. 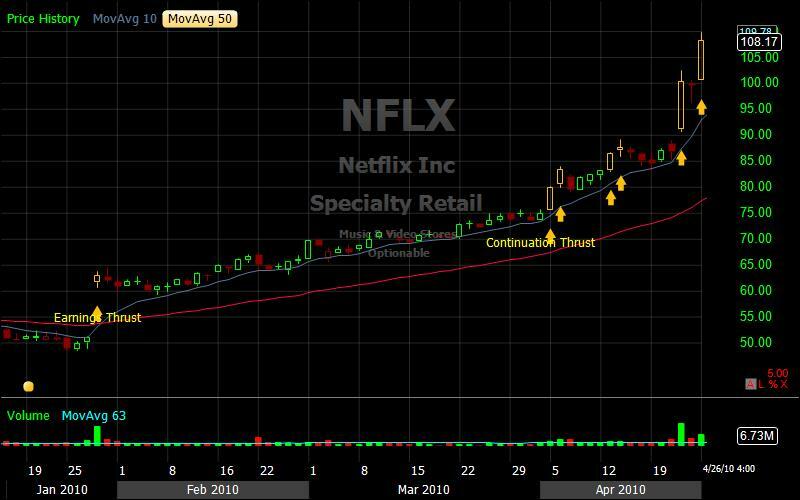 Then on April 5th, NFLX displays a Continuation Thrust with a new 5 day high on above average volume after a sideways move. I'm not going to get into stops because that is a very long topic in itself but if we were using an pSAR stop, you would have been out at a close price of 85.31 on April 16. If you're interested in the different types of chart patterns; How Charts Can Help You in the Stock Market by William L. Jiler is a good reference. Chapter 6: Line and Saucer Formations and Chapter 10 Continuation Patterns seem to be the sections I often refer back to read. Trading Tools - When you get to the point where you feel comfortable in the market and want to throw some money at your tools, you have several options out there: Telechart, StockFinder, Tradestation, Ninja Trader, Think or Swim etc. BEWARE - These tools while handy can also add to your noise level as you constantly mess with different indicators! Stockfinder gives you some handy options where you can drag and drop or script out criteria (similar to PCF scans in Telechart). The arrows and orange highlighted bars match the criteria in my scan so they are automatically flagged on the chart. To get the watchlist from our Google spreadsheet to StockFinder, simply create a new Watchlist in stockfinder named "Top Stocks with Price and Sector Momentum". Next select all the cells in the Symbol column in the Google Spreadsheet and Copy them (Ctrl + C). Finally, right click in the StockFinder watchlist pane and select "Paste" from the menu. Voila! You can now monitor the stocks using Stock Finder. By clicking the PF_BreakOut scan in the chart pane, all stocks in the top 50 watchlist will be scanned for any matching the criteria. You should be able to download by default layout in StockFinder by going to "Share" in the top menu. Then select "Browse other users shared items" and then scroll down by name "PatientFisherman_Default". The password is "momentum". This is a work in progress so the layout will be influx for an indefinite amount of time. In summary, you can use our Watchlists to narrow your stocks down to the best stocks with highest momentum weighted against sector and value. Then, you can use the Google spreadsheets to actively find stocks signaling a Continuation Thrust. Finally, you can review the stock's setup by using tools such as stockcharts.com or stockfinder to make a final decision. I'd also like to be able to easily track these stocks post earnings in 3,6 and 12 month increments to see how the PEAD effect is working (or not working). I think if we could track these stocks post earnings, we might be able to deduce the characteristics of stocks that truly have rocket fuel driving their shares. Anyway, thanks again for a great resource and much luck on the new site. Thanks Darvas - For the past few months I have been storing Earnings information for this exact reason. Normally, on the weekend I provide a list of stocks that have held up well: within 20% of their high, RS >= 90 and so on. Shoot me an email with criteria you want and I can send it over to you in a spreadsheet. For instance, all stocks with earnings suprise >= 100%. I'm working on adding a flag for Upward guidance but it's not there yet. Cool, let me think it through and I"ll send it off to you through here or if you'd like, I could send to your email address...whichever works best for you. I'm afraid my spreadsheet and overall computer skills (or lack thereof) are a hinderance to my research. Probably why I try to keep things as simple as possible. Thanks for the good words and suggestion. I added finviz to the section discussing charting software. take it easy. I am having trouble trying to import the Top 50 stocks to a watch list in Stockfinder. I created a new watch list as "Top 50 Stocks w/Price & Sector Momentum" and copied the list of symbols in GoogleDocs but, the list will not paste in the Top 50 watch list pane. When right clicking in the pane, a menu from Stockfinder comes up without a paste function. Any suggestions would be appreciated. I thank you for all your effort in compiling these lists. P.S. Any trout out your way? Tom, can you verify the symbol column was copied by opening up notepad and hold Ctrl + V down to see if they copy into notepad? Drop me an email: patientfisherman@gmail.com and I will step through it. When you are looking at the spreadsheet if others are also looking at it then copy function does not work.The easy solution to that is to create a copy of the spreadsheet and then you will be able to copy and paste. To make a copy look under "File"
This is a modern and essential website about financial market. I like it very surely. Thank's for published this website. If you want more informastion about stock charts to visit stock charts As a stock dealer there are numerous various sorts of software application that you are able to utilize. The leading thing that you can do is wearing stock charts. Several stock dealers really don't evaluate stock charts, they simply have broker vocation for them. I might truly believe that a stock chart is something that every speculator wants just not matter what you trade. Investing in stocks is one of my plans at this time. Earning from forex is the good opportunity for healthy income.